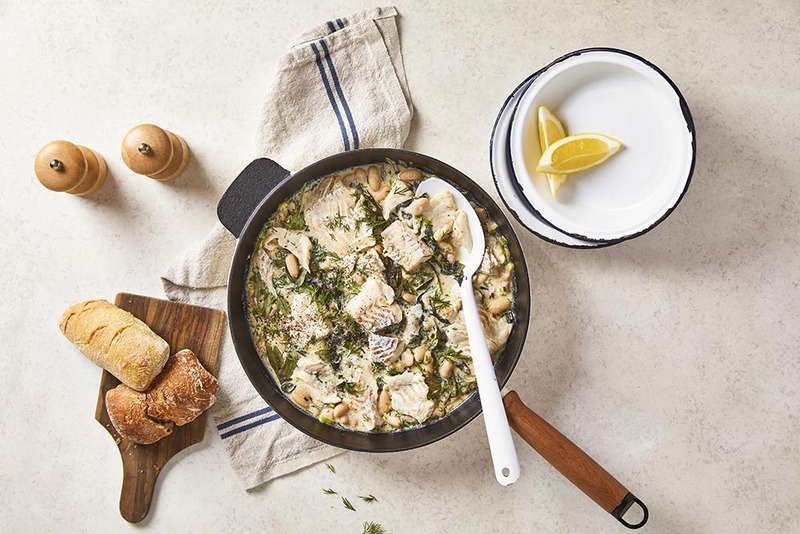 This tasty stew is packed with cannellini beans, baby kale and haddock pieces. Preheat the oven to 220C/ 200C fan/gas mark 7 and boil a kettle. Add the ciabatta rolls to a baking tray and put the tray in the oven for 6-7 mins or until warmed through. Meanwhile, heat a large, wide-based pan with a matching lid with a drizzle of olive oil over a medium heat. Chop the spring onions roughly. Drain and rinse the cannellini beans. Once hot, add the chopped spring onion and cannellini beans to the pan and cook for 1 min. Meanwhile, add the vegetable stock cube to the pan with 250ml boiled water and bring to the over a high heat. Add the soft cheese and the juice of 1/2 lemon and give everything a good mix up until fully combined. Add the baby kale and cook, covered, for 1 min or until it begins to wilt. Give everything a good mix up, then sit the haddock pieces over the sauce. Cook, covered, for 1-2 mins further or until the haddock is cooked through. Meanwhile, snip the chives and dill with scissors. Cut the remaining lemon into wedges. Once the fish is cooked, gently stir the chopped herbs through the sauce.